Do you find it impossible to pack on the muscle you crave? No matter how hard you train or how much food you devour you don't seem to grow? Are your hands covered in calluses from all the punishing sets but you're still not covered in muscle? In moments of weakness do you even think about giving up... DON'T GIVE UP - GET MyoMASS'D UP! MyoMASS was made for the gym cursed 'hard gainer'. Each serving delivers an enormous muscle building 960Kcals, 78g Protein and 75g Carbs*! 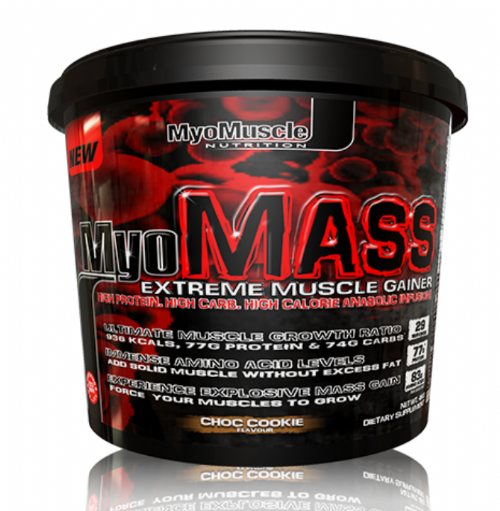 Unlike most mass gainers, MyoMASS delivers more highly anabolic protein than anything else! Why does this matter? Most mass gainers are bulked up with cheap sugar and a sprinkle of protein. In other words alternatives may deliver similar calories but they do NOT deliver similar results! MyoMASS supports MUSCLE GAIN. Lesser, low protein mass gainers support FAT GAIN! There's a massive difference between adding solid muscle and getting fat! With MyoMASS the ultra high protein content ensures that more calories are converted into slabs of solid muscle. MyoMASS provides the calories and protein needed to support your mission to become a true alpha male 'mass monster!' don't settle for being average, SIZE DOES MATTER! "By far the best protein shake I have ever had true value for money aswell. Constantly look forward to the next as the taste is delicious. Hat off to myo muscle keep up the good work 👍"
"By for the best mass gainer ive tasted. Vanilla ice cream popped in the freezer for an hour is actually like vanilla icecream but with nearly 80g of protein in. Also seem to be recovering from workouts much quicker and finally gaining weight."